March 28, 2016 – San Diego, CA Janssen Pharmaceuticals is still in the hot seat for its antipsychotic drug Risperdal as cases against the Johnson & Johnson subsidiary move forward in U.S. courtrooms. Janssen and J&J have been accused of failing to warn doctors and consumers about the potential risks of taking Risperdal, including the swelling of breast tissue in men and young boys called gynecomastia. Several cases have already settled against the companies, including a $2.5 million settlement to a man who developed 46 DD breasts while taking Risperdal as a teen, and a $1.75 million settlement to a 21-year-old Maryland man who began taking the drug at age nine. Both cases were settled in 2015, but the latter was reduced to $680,000 earlier this month after J&J asked to have the verdict overturned. What is Risperdal and is it safe for children? Risperidone, the active ingredient in Risperdal, is an atypical antipsychotic agent that works by blocking the brain’s receptors for dopamine and serotonin. 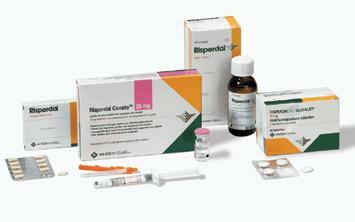 Risperdal was approved by the U.S. Food and Drug Administration (FDA) in 1993 to treat schizophrenia in adults. A decade later, it was officially approved to treat bipolar disorder in adults. Before it was approved for expanded use, Risperdal was prescribed off-label to treat certain mental health disorders in children, adolescent and elderly patients, despite a lack of clinical trials to prove the safety of the drug in these age groups. In 2013, J&J shelled out $2.2 billion in a lawsuit with the federal government that accused the company of improperly marketing Risperdal for unapproved uses, including in children and the elderly. Risperdal has never been approved for use in elderly populations; however, in 2006, the FDA approved the use of Risperdal to treat irritability in children and adolescents with autism. One year later, it expanded that approval to include adolescents with schizophrenia and bipolar disorder. The FDA’s approval was based on a clinical trial backed by the makers of Risperdal which studied children and adolescents with autism between the ages of five and 16. The study found Risperdal to be both effective and safe for kids and teens. But during a lawsuit against Janssen and J&J nine years later, it was revealed that two data tables were missing from the study, downplaying the possible risk associated with Risperdal and gynecomastia in young boys. Does Risperdal cause breast growth (gynecomastia) in boys? Risperdal has been shown to increase a protein in the body called prolactin. Prolactin is responsible for enabling the production of breast milk in mammals, among other things; higher than normal levels of prolactin in the blood can trigger gynecomastia in boys and men. Gynecomastia causes boys and men to develop female breasts and can lead to psychological and emotional trauma. Several studies have been published which indicate Risperdal may contribute to the development of gynecomastia, especially in young boys. A Swiss study published in 2006 in the Journal of Clinical Psychopharmacology indicated that “risperidone administered to adolescents at doses commonly used for the treatment of psychotic symptoms can strongly increase prolactin levels, with clinical consequences such as gynecomastia…” The authors of the study found that of the 10 adolescents treated in their unit with risperidone, three boys developed gynecomastia. Almost all of the adolescents (eight out of 10) had elevated levels of prolactin in their blood, though not all showed symptoms. A Canadian study published in the Journal of Child and Adolescent Psychopharmacology last year came to a similar conclusion. The study relied on a database to pinpoint a cohort of males aged 15 to 25 who have taken Risperdal or risperidone. The study found that the cohort was four times more likely to develop gynecomastia compared to the control group (males of the same age not taking Risperdal or risperidone). When the cohort was limited to teens aged 15 to 18, the study found those males were five times more likely to develop gynecomastia. Young men who have taken Risperdal and suffered from side effects like gynecomastia are filing suit against Janssen Pharmaceuticals and its parent company, Johnson & Johnson. Gynecomastia can have serious emotional consequences and may require surgery to correct. If you’ve been harmed by the makers of Risperdal, you can hold them accountable by standing up for your legal rights. Contact the Hood National Law Group today to see if you qualify. Call us at 1-800-214-1010 or use the form on the right-hand side of your screen for a free case evaluation.